Jacob Berend (Jaap) Bakema (March 8th, 1914 – February 20th, 1981) was a Dutch modernist architect, notable for his public housing and involvement in the reconstruction of Rotterdam after the Second World War. Born in Groningen, Bakema studied at the Groningen Higher Technical College (1931-1936) and the Academy of Architecture in Amsterdam, a student of Mart Stam. In 1948 Bakema was approached by Johannes van den Broek to co-manage the firm Brinkman and Van den Broek Architects which van den Broeck led together with Johannes Andreas Brinkman. 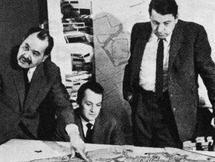 In 1951, two years after Brinkman's death, the Rotterdam architectural practice was renamed Van den Broek and Bakema. The Van den Broek and Bakema firm was to play a leading role in the Dutch post-war reconstruction effort and the resolution of the housing shortage. The firm achieved international renown with projects like the Lijnbaan shopping centre (1949-53) and the building for the stores of Ter Meulen, Wassen and Van Vorst (1948-51) - both in Rotterdam. 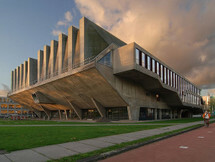 In the same period the practice had its first commissions for Delft University of Technology, including the design of the Faculty of Architecture (1959-64) and the Auditorium (1959-66). Among their most distinguished projects are the housing at Hansaviertel, Berlin (1957-60), the town halls of Marl (1958-62) and Terneuzen (1963-72), the Kennemerland regional plan (1957-59) and the monumental Pampusplan (1965). Bakema played an important part in the Rotterdam 'Opbouw' group, which, together with the Amsterdam group 'de 8', made up the Dutch delegation of CIAM. In 1946 Bakema was invited to a CIAM congress for the first time. He became the secretary of CIAM in 1955 and went on to prepare the tenth CIAM congress with the other future Team 10 members, and then acted as coordinator at the last congress in Otterlo. After CIAM was disbanded, Bakema played a prominent part in Team 10, both as an energizing force and a binding figure who kept the group together. His office acted as the 'post box' for the group's activities. Bakema was also a board member of the society Architectura et Amicitia, publisher of the journal Forum. From 1959-63 he was part of the editorial board of the magazine, which also included Aldo Van Eyck and Hermann Hertzberger, using the magazine as a platform for Team 10 ideas. 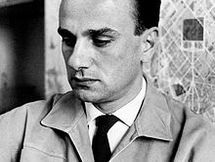 Bakema summarized his urban and architectural ideas under the notion of 'architecturbanism' and 'Total Space', an idealistic, almost cosmological outlook on the human habitat and existence. In keeping with the CIAM line, the practice carried out research into new residential districts and ways to develop a new approach to urban design. They applied the ideas of the neighbourhood unit (the so called 'wooneenheid') and the visual group to develop new dwelling types and ordering principles for urban functions. Bakema became a professor at Delft University of Technology in 1964 and professor at the Staatliche Hochschule of Hamburg in 1965, as well as a visiting professor, among others at Columbia University (New York) and Cornell University (Ithaca). His partner Van den Broek left the practice in the early 1970s. Bakema stayed on until his death. Thereafter the firm carried on and continues to operate today under the name 'Architectenbureau Van den Broek en Bakema'.